Connor Sutton, Stephanie Hill, Justin Engels and Bill Bernard. Celebrating its most successful fundraiser to date, Ascendigo ended Saturday night on a high note. 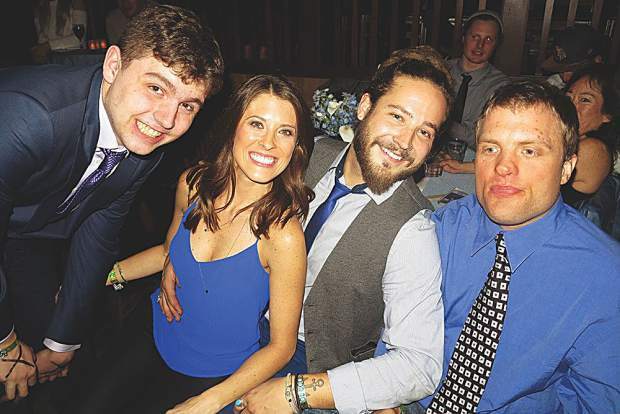 The Carbondale-based nonprofit that serves local, regional and national populations of youth and adults across the autism spectrum brought the community together for their benefit event at Belly Up. The Presidents Day weekend event was awash with a blue hue as guests dressed in every shade from indigo to navy to ultramarine to cyan to turquoise to Prussian blue and beyond in support of this very worthy cause. The night began with colorful cocktails and a delicious dinner, followed by inspiring guest speakers, including John Donvan and Caren Zucker, who co-authored the book “Different Key: The Story of Autism.” Speaking onstage together, they shared perspectives on the importance of “accepting people who are different” and how studies show that environments in which autistic individuals are supported allows them to live a better life. Peter Bell, president and CEO of Ascendigo since May, emphasized the importance of community and how we all can improve the lives of those living with autism. Next up was a vibrant live auction with significant support from the guests, who helped the event surpass all previous ones, followed by an energetic show from Vintage Trouble — a rhythm-and-blues band from Hollywood. All proceeds from the event benefit Ascendigo, which provides opportunities for growth and independence through adventure sports camps, a comprehensive life program for autistic adults and outreach services for local families and schools. Learn more by visiting http://www.ascendigo.org.